This is Lucy who is a lovely Jack Russell. Im amazed, this is Lucy. You've done a wonderful job for me, and I am thrilled. You've also captured her age in this portrait, and the expression in her eyes, which in a Jack Russell can sometimes be quite inscrutable. My old collie cross used to smile with his eyes! This is just lovely - it’s Lucy as we know her and it is going to give my family so much pleasure to receive it. I know it will have pride of place in their home. I really appreciate your marvellous talent, and the obvious feel you have for animals, and would like to thank you for doing this portrait for me in the short time frame I’ve had. It has been fascinating to watch the picture emerging. Many thanks once again, it’s delightful. 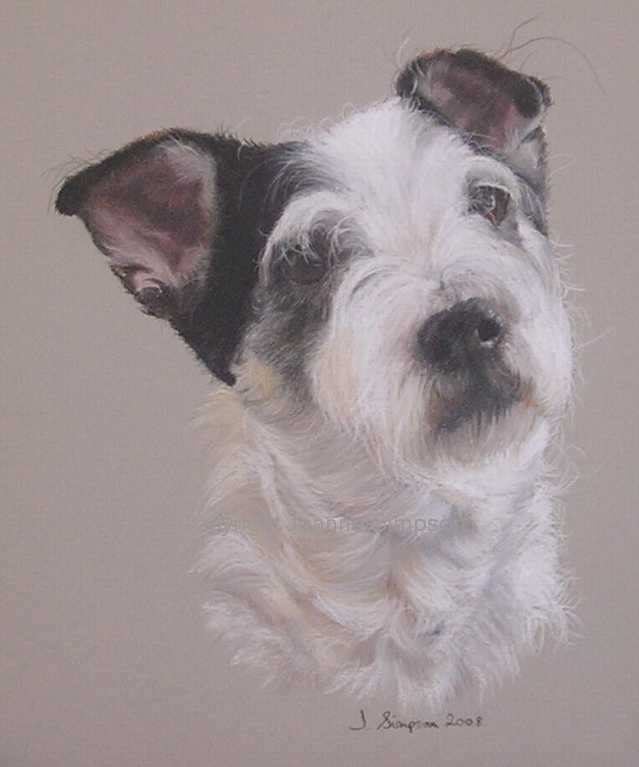 My sister and brother-in-law recently commissioned a portrait of our Jack Russell, "Lucy" for my husband's 65th birthday. We were so thrilled with this beautiful present. The likeness is amazing, even her wispy bits on her ears, which she has had since she was a puppy. She'll be 14 this year, and this wonderful portrait means she'll be with us always. We have taken a photo of the framed portrait, which we will pass on to my sister, to forward to you.